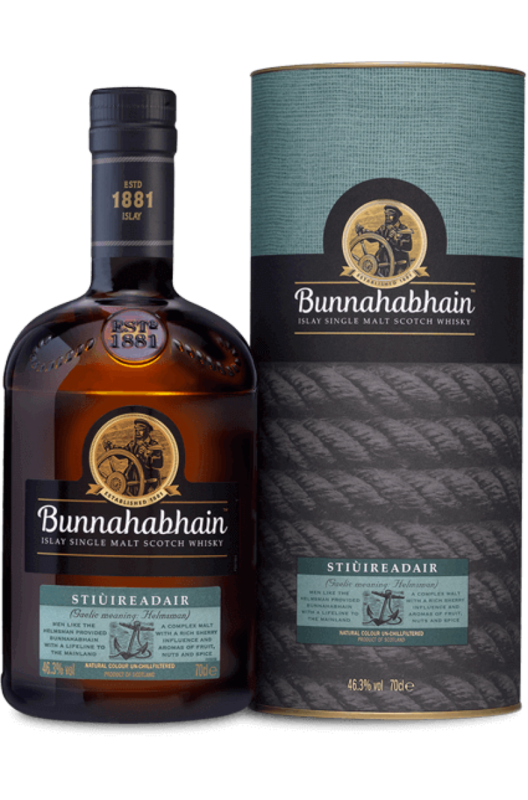 Stiùireadair means Helmsman in Scots Gaelic and relates back to Bunnahabhain's heritage. Being surrounded by the sea, the Bunnahabhain pier was once a spot where the Helmsman would return back too. This whisky has been matured in both first fill and second fill Sherry casks which has been matured in different warehouses surrounding the distillery to ensure maximum coastal flavour. Taste Creamy mouth feel with a dried fruit influence, sea salt, creamy caramel with hints of nuts and a gentle spice. Nose Dried fruit and creamy caramel with hints of brine, vanilla, nuts and a touch of spice. Finish Long and lingering with hints of dried fruit. A smoky and peaty version of Bunnahabhain, Cruach-Mhona (pronounced Cru-ach Vhona) means peat stack ..